Contracard has partnered with VirtualBarter, the online leader in worldwide barter and trade, to provide you with the ultimate online global trade marketplace and trade account management system. 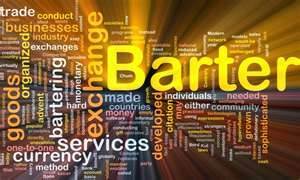 Through its Barter Network, Enterprise Exchanges, vBarter Software and Corporate Trade Group, VirtualBarter empowers trade exchanges, companies and organizations throughout the world with the invaluable benefits of enabling their members and clients to trade their under utilized production, capacity and inventories in an online global trade marketplace. The Global Trade Alliance is comprised of numerous independent barter exchanges and thousands of small to midsize businesses that trade through them. The alliance features national and international trade associations, specialized business magazines, publications, media companies and online business communities each having their own branded customizable barter and trade exchange, all which collaborate in the global trade marketplace. Utilizing vBarter state of the art Internet based software, Contrabart members are empowered to manage, merchandise, and market their products and services to an integrated worldwide network of trading partners and to purchase from trade exchange members throughout the world. Built from the ground up as an Internet based trading and trade banking system, vBarter brought to you by Contracard is all you'll ever need to run and manage your trade account. Your membership in Contrabart enables you to collaborate in an open global network of tens of thousands of members at independent exchanges and trade with each other utilizing your own trade dollars via automated transparent exchange offset currency processing between exchanges. Contrabart, enhancing your trading experience with by far, the most advanced system available in the barter industry, backed by VirtualBarter, a team you can count on!